If you have been waiting for a touch of stealth to hit adidas latest creator boot, it is here as aprt of the Magnetic Storm pack. 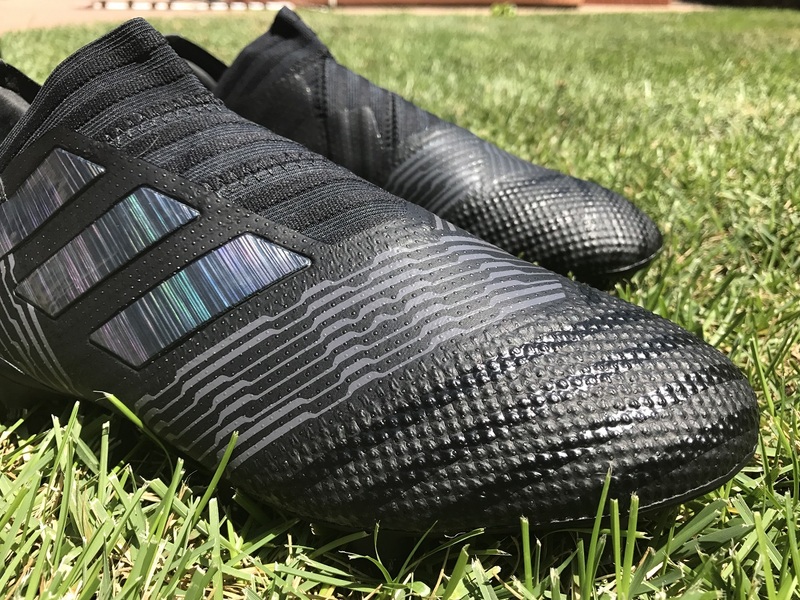 Since their introduction to the market a few months back, the adidas Nemeziz 17+ 360Agility series has become a firm favorite with fans thanks to their perfectly balanced laceless syling. adidas delved deep with the development process on this one, tapping into a common ritual in ancient battle, in dance and in sport: the use of taping for increased physical and mental strength. Yes, we are talking medical tape of bandage wrap here, with individual layers used to wrap around and lock down the foot. To call the overall design wild is an understatement, with the 3-stripe taking on a completely different type of construction technique. 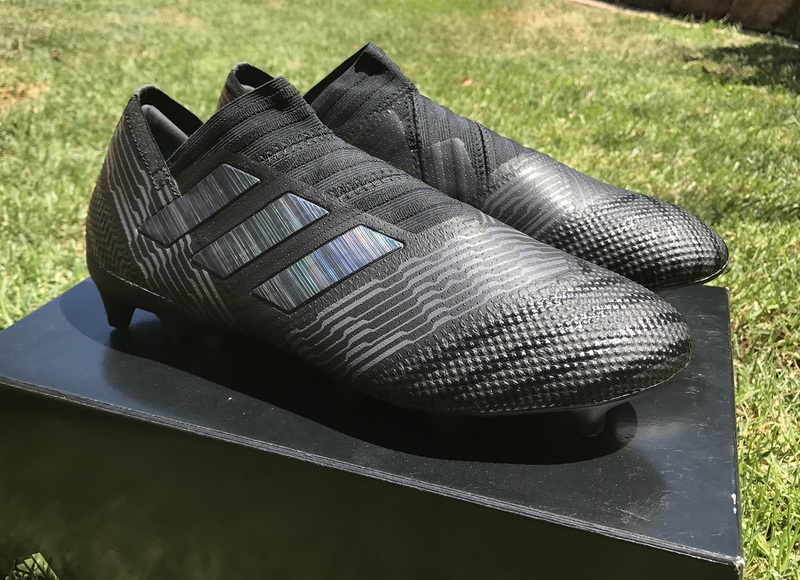 Here is detailed recap of what you can expect should you want a pair of Magnetic Storm Nemeziz. You can also currently find them on sale at soccer.com. 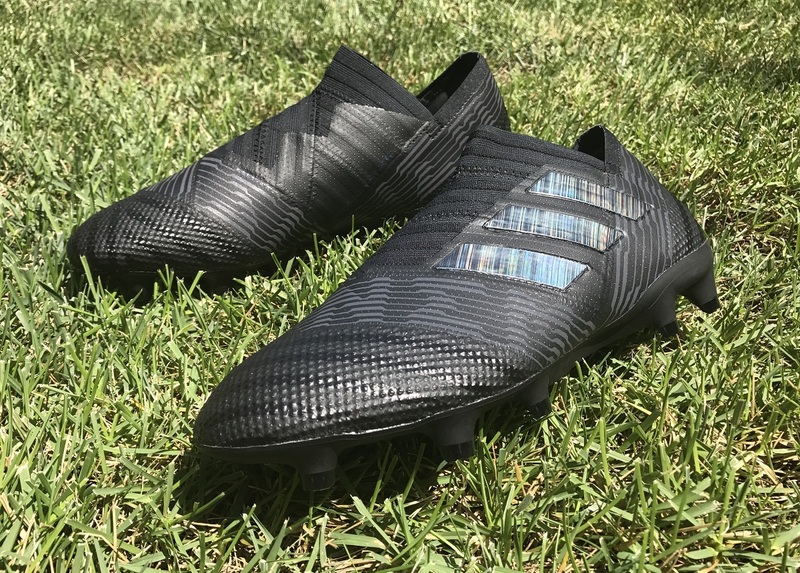 These boots were released as part of the extremely popular Magtetic Storm pack, a series that harnesses stealth black with flashes of irridescence on key feature areas. Visually, you can differectiate different areas and characteristics via the unique level of texturing through the forefoot. 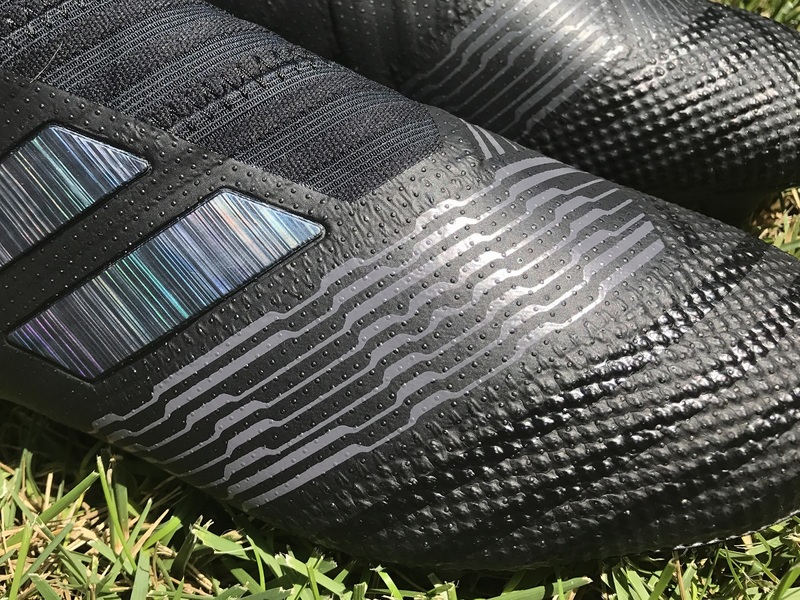 Signature Nemeziz text is again placed across the front midfoot band, but it is a lot less prominent on this version compared to others because of the similar dark grey color used. Underfoot, the soleplate gets an extremely unique Matte Black paint job, and it looks glorious. In recent times, boots have feature more of a reflective metallic, so this adds something fresh to this release. These boots are built on the ideals of bandages and unparalleled agility. To design the ultimate tool for the agile soccer player, adidas tapped into a common ritual in ancient battle, in dance and in sport: the use of taping for increased physical and mental strength. The unique AGILITYBANDAGE features revolutionary TORSIONTAPES technology to keep the foot locked down and deliver ultimate fit. It starts around the ankle, where pieces are layered across each other to create an entry point. This runs through the lacing system and down to the touch and control region of the boot. And that is where you will find the second piece of the jigsaw, with a new AGILITYKNIT 2.0 interlocking yarn structure provides a soft direct touch and a lightweight adaptable feel. This the region around the very front of the boot. Across that portion, adidas has covered the AGILITYKNIT with a super thin synthetic layer to provide durability and enhance the texturing through the region. It ends up have a very bumpy feel that helps add grip and improve touch on the ball. Being that they are laceless you won’t be surprised to hear that the fit is naturally very snug across your foot; it has to be. But, because the material is like a bandage, it has ample room to stretch. 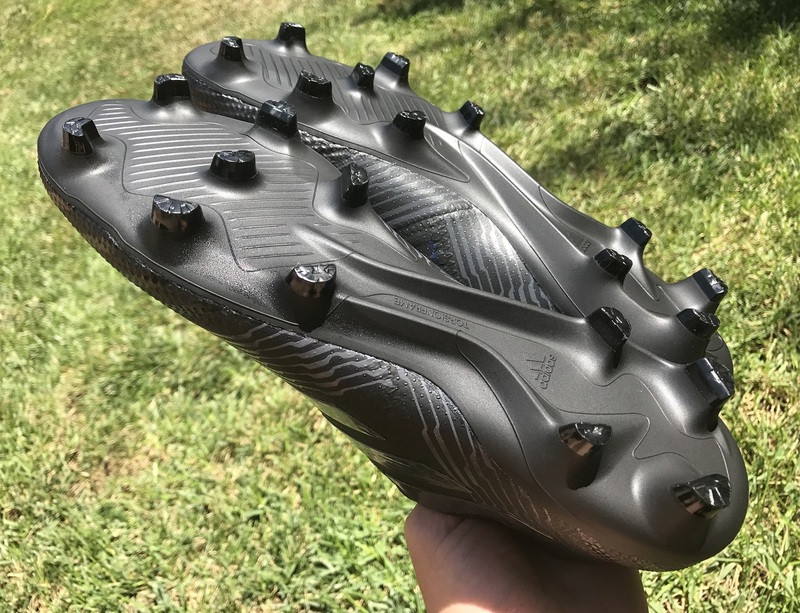 Of all boots on the market, this is the one that will offer the best fit across different foot shapes. My medium/wide foot was very comfortable inside and there were no pressure points. In fact, they feel a lot like you are wearing a pair of tight slippers and they make for one of the most natural fitting boots you will ever wear. In terms of length they are true to size, very much in the mold of other adidas boots such as the Purechaos and Purecontrol. Basically, when it comes to fit you have to know going into wearing that it is a laceless boot with a very snug fit to keep them on your feet. This is not like a Totti Tiempo Legend that you can open the laces on, pull down the tongue and run loose on your feet. 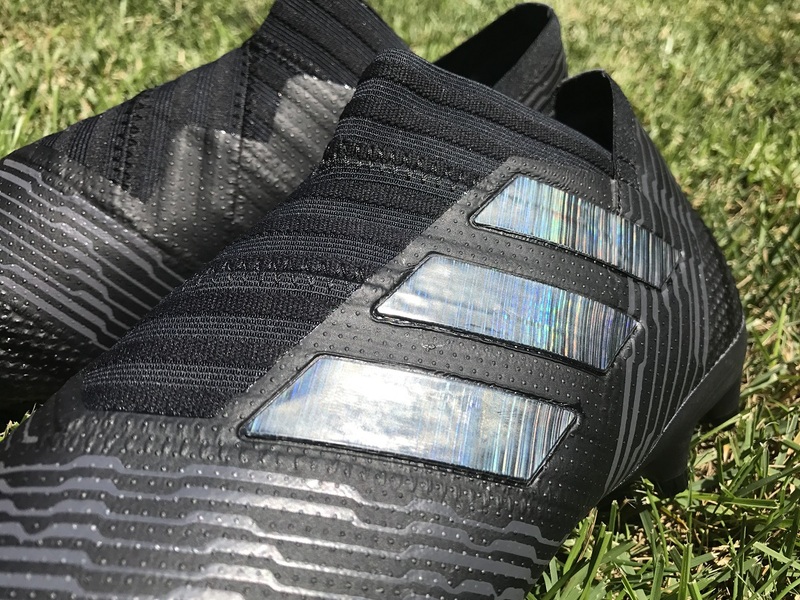 Compared to all laceless boots released to date, these provide the most natural feel thanks to the incredible stretch properties in the upper material, so there is definitely optimism for wider fitting players that want to give them a shot. But again, they are intended to fit snug! 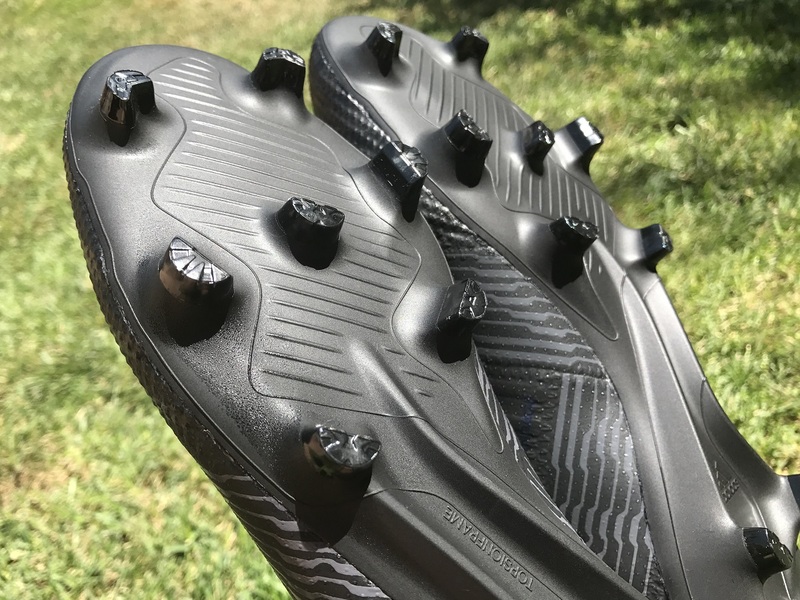 If youa re looking to read our full and complete review of the Adidas Nemeziz 17+ 360Agility that covers all aspects of the release, you can find it here. I’m going to break this one down in its own post. But, in short, there actually isn’t a great deal different between both. I found the Nemeziz 17+ fit very snugly and never one felt like they were going to slip off. adidas has created an excellent fit. The Nemeziz 17.1 offers you the ability to be able to secure an even tighter fit across the top of your foot, allowing you to dictate the level of pressure between boot and foot. So, realistically it all depends on exactly what you are looking for! The toughest selling point to these boots is their pricepoint, with a listing of $300 adding to the exclusivety of the series. I hate the price, but they really are a pretty phenomenal boot and perform excellently in-game. In fact, they prove all too easy as a top option to recommend to players. As a sort of positive, this particular colorway is one of the first to go on sale. You can currently find them for $274 (with free shipping) at soccer.com. I bought these and am having a difficult time with them. When I wear them they feel great, until i take sharp turns and the shoe feels like it is going to slip off. I find that none of my socks get very good grip with the inside of the shoe, causing my socks to rotate around my foot and become uncomfortable. Does anyone know how I can fix this issue??? Hey Seth, You could try using some TruSox or the need speed insert that Storelli recently released. Without laces, you are at the mercy of the fit of the boots compared to your foot. Something with added grip should help keep you locked in.